These Terms of Service apply to all transactions between Better Yarn Store and yourself. Please read them carefully. We may change these Terms of Service at any time. Any changes will take effect on the date they are posted on our website. All prices shown are in euros, including VAT, excluding shipping costs. These will be payable once the order is placed. All prices are subject to changes without any notice. Reduced prices for sales and promotions are only valid for the specified period. All images used are for illustrative purposes only and whilst we endeavour to display all products as accurately as possible items may slightly differ from images shown. Occasionally there may be information on our site that contains typographical errors, inaccuracies, or omissions that may relate to product descriptions, pricing, promotions, offers, and availability. We reserve the right to correct any errors, inaccuracies or omissions and to change or update information or cancel orders if any information on our site is inaccurate at any time without prior notice (including after you have submitted your order). After placing an order, you will receive a confirmation email with the total cost, including shipping. Your order will be shipped only after your payment is received. PayPal: This safe and secure method guarantees that your bank account details and/or credit card details remain hidden on the Internet. You would need to create a PayPal account (www.paypal.com), but it offers an outstanding flexibility and security to both consumers and merchants. Bank Transfers: In case you wish to pay via bank transfer, please note that the order will be shipped only once the payment has been received. You will find all the details to complete the payment in the confirmation email. Credit Cards: You can pay with your credit card through PayPal, no account needed. 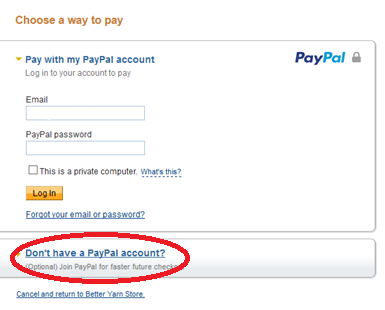 Just choose 'PayPal/Credit Card' as a payment method during the check-out and you will be redirected to PayPal's page. Instead of using 'Pay with my PayPal account' choose below 'Don't have a PayPal account' and you can finish the payment using your credit card information. It is safe and quick way to get your online orders paid without PayPal account. We use Bpost to deliver your orders. We are not liable for lost or stolen orders by Bpost. In case of lost package we will try our best to find a satisfying solution for you. Please see to it that you provide the correct shipping details. We are not liable for incorrect or delayed delivery due to incorrect on incomplete shipping details. Our shipping rates are flat rates, based on the location where we ship to. You have the right to cancel your order within 14 days of receipt of the goods. Should you wish to cancel your purchase within 14 days, please contact us in writing to: info[at]betteryarnstore.com When cancelling your order goods need to be returned new and unopened in order to receive a full refund of the goods. Return postage cost will not be refunded. Faulty or defective goods will be fully refunded. In this instance we will also refund the original and return postage costs. Please ensure there is a copy of the postal cost receipt returned with the faulty item(s) so that we can reimburse this amount. Please do not return by courier as we will not accept full courier charges. Please return products with appropriate packaging (the original, undamaged packaging is best; please note that wound yarn is not returnable) and the original delivery note - please let us know why you are returning the item. You are also advised to return goods by registered mail. Proof of postage will not be accepted as proof of delivery. As soon as we receive your products in re-saleable condition, we will issue you a refund and confirm this by email. We do not share any of your information and only utilize your personal information to conduct business with us or to forward information to you. We do not share your personal information although sites that help us deliver services (i.e. : payment providers) may require your information. Any external links that we incorporate on our site may also ask for information from you and these sites may have their own privacy policies. At any time you may request that we delete your personal information or you may unsubscribe to our newsletter.